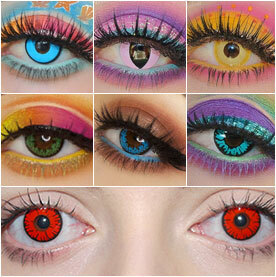 | Stores That Sell Colored Contacts, Do They Exist? Where oh where can you find some non-prescription Colored Contacts in store? Well, at the time I write this you can’t find them anywhere in stores, legally or without risks! Let me explain why, and give you some good news! Whether they’re regular contacts, colored contacts, or even these zombie contacts, the FDA classifies them as a medical device, even if you have perfect vision. That means the store that sells them are required to contact your optician to make sure they approve you for the lenses they’re selling you. So what if you find a store that sells them? Well, I’d be careful cause colored contacts can easily come from some sketchy manufacturers, made from material that is untested and possibly harmful to your health all on its own. I have some good news, well some future good news rather. CamoEyes.com is working on a project that will allow stores to not only sell you colored contacts, but also verify your prescription with your optician. Including non-prescription contacts, by non-prescription I mean, colored contact lenses that don’t correct vision at all.